On your first encounter, you might feel conflicted. Your lizard brain will react to a 15-ton carnivore swimming directly at you. But then your frontal cortex will kick in, reminding you that this, the largest member of the shark family, feeds only on things less than the size of your pinky finger. Whale sharks truly are the gentle giants of the shark family, cruising the ocean at a no-worries pace while slurping up clouds of plankton and tiny fish. For divers and snorkelers, this is a must-see. You can find whale sharks in tropical and temperate oceans around the world, or sporadically spot them at many other locations. But there are also specific places where the big fish gather to feed and breed, giving humans a near-guaranteed chance for a meetup: the most consistent and convenient destination in North America lies just off the northeast coast of Mexico’s Yucatan peninsula. Each summer, whale sharks gather in these waters to feast on clouds of eggs released by spawning tuna. This event is thought to be the largest single aggregation of whale sharks in the world, routinely attracting more than 200 individuals. This natural phenomenon was first discovered by local fishermen living on the small island of Holbox, on the northeastern corner of the Yucatan Peninsula, about 40 miles from Cancun. As word spread, the first wave of adventurous underwater photographers and researchers descended on the islands in the 1990s. By the early 2000s, the gathering spawned a fledgling tour business, and Isla Holbox was firmly on the ecotourism map. Today, there are dozens of tour operators based not only in Holbox, but also nearby Isla Mujers, which is closer to the resorts of Cancun. The official whale shark season usually runs from early June to mid-September, and guides operate under a permit system. Encounters are now regulated by rules of engagement that ban scuba diving—the bubbles can be invasive—and ban actually touching the animals. Swimmers are expected to stay at least a body’s length away, but in reality, that’s dramatically close to something that’s 30 to 40 feet long and weighs the same as a school bus. Whale sharks move at about three miles per hour. That’s slow by fish standards, but still a bit faster than most of us can swim on a sustained basis. Fortunately, you don’t have to be an Olympic athlete to enjoy an encounter. The sharks usually maintain a leisurely and linear path, which allows tour operators to drop swimmers ahead of a shark and buy time to ready cameras for the oncoming animal. Swimmers can prolong encounters by keeping pace with the animal, but most of the time, the shark will begin to gradually pull ahead. Once you are behind the tail, it’s time to disengage and scan the waters for the next slow-moving behemoth. All participants are required to wear either a flotation vest or a wetsuit. The vest option is a good choice for weaker swimmers and youngsters, while more accomplished snorkelers and free divers usually opt for the wetsuit for the added freedom of movement and reduced drag it provides. When planning a whale shark encounter in the waters of the Yucatan, your first decision will be whether to start from Isla Holbox or Isla Mujers. Since it takes more than three hours to get to Holbox from the Cancun area, you’ll almost certainly need to plan on spending at least one night on this laid-back and low-key island. Many find Holbox to be a refreshing change from the high-rise mega-resorts of Cancun. Tours starting from Isla Mujers can be done as a long day trip from hotels all along the Cancun strip, and the island also has its own collection of mid-range hotels, plus a few luxury resorts. Because swimmers are allotted a fixed amount of water time with the whale sharks, tour operators usually make it a full day by adding extra stops at snorkeling reefs or beaches. In Isla Mujeres, snorkelers might also want to check out the Museo Subacuático de Arte, which is the world’s largest underwater sculpture park. 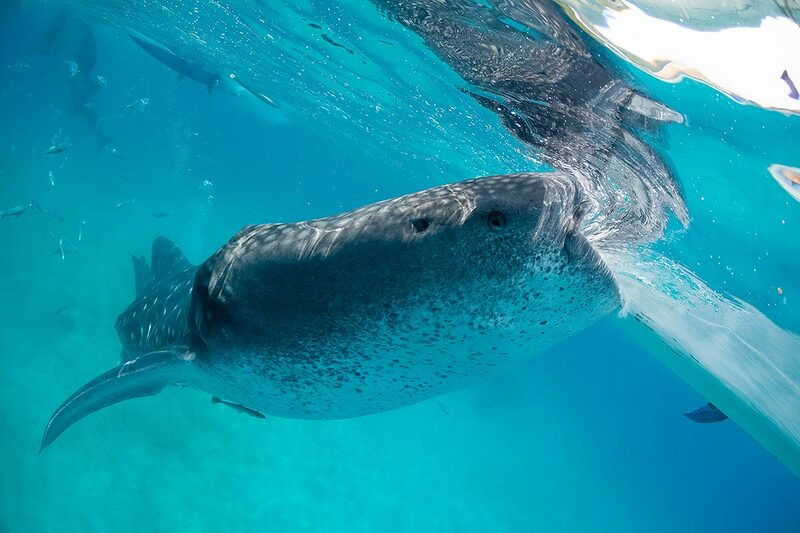 An hour north of Cabo San Lucas, whale sharks gather from early winter through late spring in the waters of La Paz Bay to feed in the plankton-rich waters. There are several tour operators who provide day trips into the bay. To round out the adventure, add a dive or snorkel trip to the offshore islands of Los Islotes, which are home to colonies of playful sea lions. Whale sharks are just one ingredient in the mix of big animals that divers meet in the waters of the Galapagos Islands. There are also schooling hammerheads, mantas, silky sharks, huge schools of tuna, Galapagos sharks and free-diving marine iguanas. Any trip to the Galapagos should include a few days ashore to explore the amazing landscapes and animals that inspired Darwin’s theory of evolution. Cocos Island is famous for large gatherings of hammerhead sharks, but its remote shores also attract manta rays, dolphins, tiger sharks, large schools of jacks and tunas and, yes, whale sharks. This isn’t a destination for land lubbers, because getting to this uninhabited outpost requires a 36-hour boat ride from the Costa Rican port of Puntarenas. Whale shark encounters are all but guaranteed on the island of Cebu. Near the village of Oslob, whale sharks swim into shallow coastal waters to accept an offering of shrimp from local fishermen. It’s a sort of reverse zoo, as divers and snorkels must remain within a buoyed area just off the beach, while whale sharks are free to come and go, either interacting with humans or moving on as it suits them. With some 1,200 small specs of land grouped around 26 coral atolls spread out across 35,000 square miles of ocean, the Maldives present seemingly infinite opportunities to run into a whale shark. That said, the sharks are generally most commonly seen around South Ari and Baa atolls, and the best odds of an encounter come when booking passage aboard one of the liveaboard dive and snorkel boats that cruise the islands. Ready to meet the biggest fish in the sea? 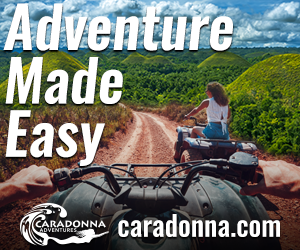 Caradonna Adventures can help you plan the trip. We’ve been to theses whale shark hot spots, and know the best times to go, the best places to stay and the best tour operators to book. Give us a call or drop a note to [email protected] or call 1-800-330-6611 with any questions.